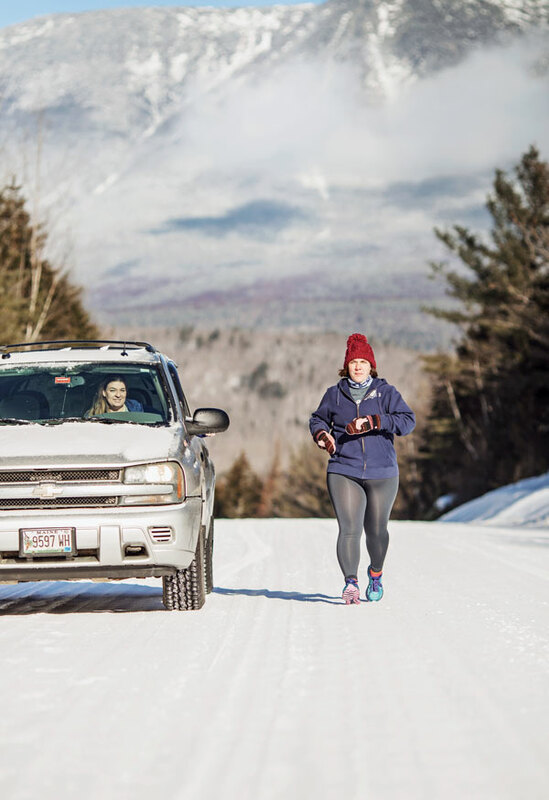 Joelle Ingalls was nearing the end of her second Millinocket Half Marathon this winter when she decided to text her husband back in Surry. Seconds later, her phone buzzed furiously. “Say what?” he wrote back, understandably confused, since his wife had registered only for the half, which he correctly thought to be 13.1 miles. She’d changed her mind, Ingalls wrote. She was going to attempt the full marathon. Her first ever. On next to no training. In December. In the snow. Ingalls didn’t die. The 39-year-old paralegal — who ran while carrying stones from The Summit Project, engraved with the initials of fallen Maine soldiers — finished 26.2 miles in a little over eight hours, crossing the finish line well after dark, the last runner to do so (two women who’d walked the course finished behind her). But the final miles were rough. After mile 19, no spectators remained along the course, which at that point was well outside of town, following the forest road that leads to Baxter State Park. Until, suddenly, there was somebody. Reenactment: The beginning of Ingalls and Blake’s budding friendship may have looked something like this. Ashleigh Blake, 28, had the day off from her job as a dental assistant, and like a lot of Millinockians, she came out to cheer and to stand around the fire at the start/finish line, shooting the breeze with neighbors and runners who’d come from all across the country to run the free (and free-spirited) marathon, now in its third year. Sometime after dark, she got to thinking that there wasn’t a sweep bus, as at many marathons, to “sweep up” runners whose pace was too slow. So she figured she’d check on the stragglers. First, she stopped at Dunkin’ for a few hot cocoas. Then she set her phone on her dashboard and recorded a video of the snow coming down heavy on the darkened road outside town. Facebook delivered, and in January, Ingalls returned to Millinocket to meet and thank Blake.